UltraView™ Desktop Manager offers 14 industry-leading features to unleash the full power and productivity of multiple monitors. The result of years of development and key industry partnerships, UltraView Desktop Manager exceeds the features and quality of all previous and current multi-monitor system software available for Microsoft Windows. Our third-generation software is the fulfillment and direct result of our 10 years experience developing, selling and supporting high-performance multi-monitor computers and displays. Many customer feature requests are delivered for the first time. 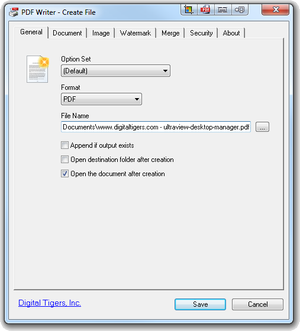 UltraView Desktop Manager replaces Zenview Manager as the Digital Tigers exclusive software suite for Windows. Bundles with new computers and displays: UltraView Desktop Manager now ships standard with new computers and multi-screen monitors sold direct by Digital Tigers. Standalone software: The standalone price is $99.00 USD (download version). Buy now! Existing customers / upgrades: The upgrade price for existing Zenview Manager customers is $75.00 USD. No matter how many monitors you have, Windows normally gives you just one taskbar that stays on your "primary" monitor. With many open applications and windows, the taskbar gets crammed with unreadable application window icons. 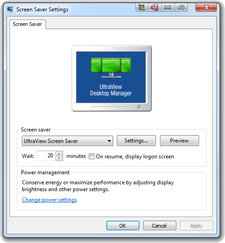 UltraView Desktop Manager solves the problem by adding a full-function Windows taskbar to each secondary monitor; each taskbar shows tasks only from the monitor it is on. This makes managing open applications much easier, and when activating an application, you'll know on which monitor it will appear. Each taskbar has a Windows Start Button and Start Menu, enabling you to launch applications from any monitor, with automatic positioning of the application on the monitor from which it is launched. Windows 7 features are supported, including Aero transparency, Show Desktop button, and thumbnail previews (shown above). 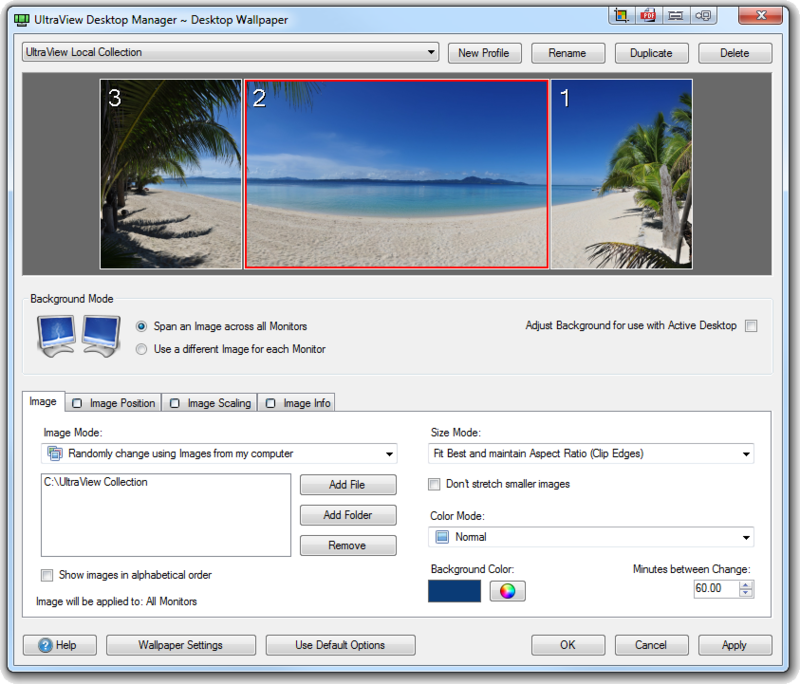 UltraView Desktop Manager has powerful wallpaper features that enable you to span your entire Windows desktop with a single panoramic image, automatically scaled and cropped to fit perfectly. 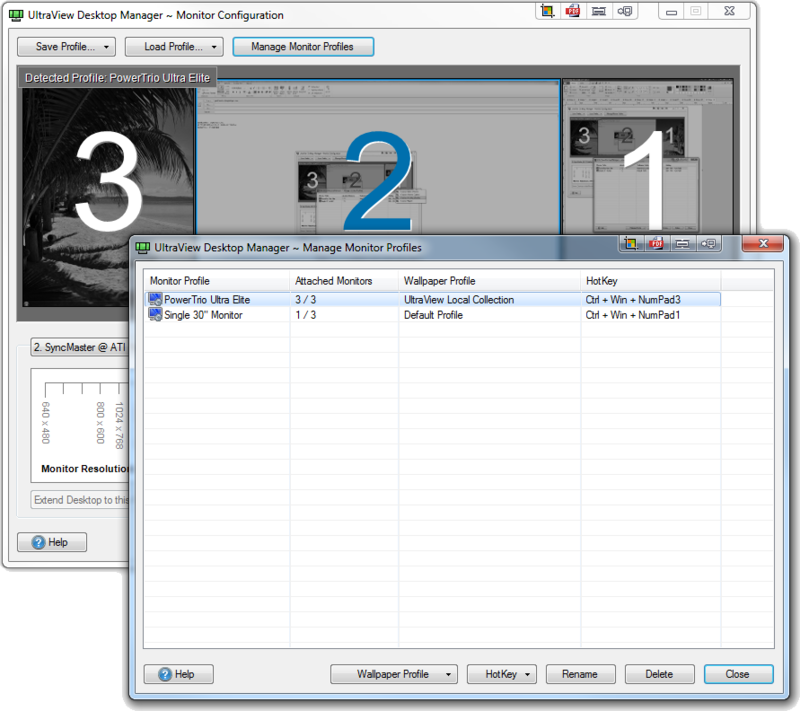 Additional options include separate wallpaper images for each monitor, and manual controls for scaling and cropping images. You can use your own source images, or search online for images using the built-in image search tools integrated with Flickr and Vladstudio. Wallpaper images can be set to rotate among a collection at any preferred interval. For the most dramatic impact, choose the UltraView Collection of more than 300 panoramic images, hand-picked to show off your multi-monitor desktop with beautiful landscapes and cityscapes from around the world. 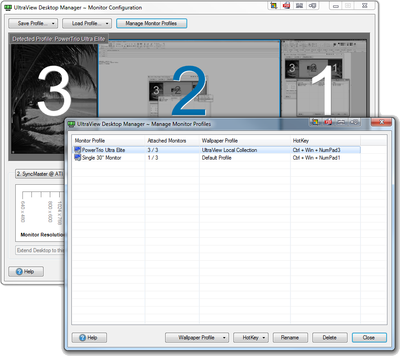 By standard configuration, UltraView Desktop Manager adds four buttons to the title bar of all of your applications. The most popular and frequently used button is "Move Windows to Different Monitor." Clicking this button opens a monitor selector popup window, enabling you to choose your target monitor by number or picture. Presto! The application jumps to the other monitor. No more dragging windows around your desktop and resizing them every time you just want to move them. This enables your multi-monitor desktop to keep up with your workflow and your thought process. to your full desktop. Clicking the button again toggles the window back to its original size. The UltraView Collection contains images hand-picked and selected to show off your multi-monitor setup. Enjoy 300+ ultra-high resolution panoramas, featuring landscapes and cityscapes. Images or the entire collection can be used for desktop wallpaper or screen saver. Images are automatically scaled and cropped to fit most multi-monitor desktops. A fresh new desktop image loads every 60 minutes, or at any preferred interval. Images can be installed locally on your computer or can be sampled on demand from Flickr. UltraView Desktop Manager adds a "Create PDF" button to the title bar of your applications. This enables one-click PDF creation from Web browsers, email clients, Microsoft Office applications, image applications, and more. Typically, if the application can print to a printer, you can create a PDF with one button click or a hotkey. PDFs can be saved and immediately viewed. A wealth of options are available if desired: appending to an existing file, password security, document properties, PDF quality levels and versions, watermarks, superimposition with a background PDF, etc. Multiple options can be combined as a reusable option set, enabling powerful repetitive operations such as archiving emails to PDF with pre-set PDF security levels. If you run many applications at once, you will typically develop a preferred desktop arrangement, with certain applications loading on particular monitors, maximized or in a window. 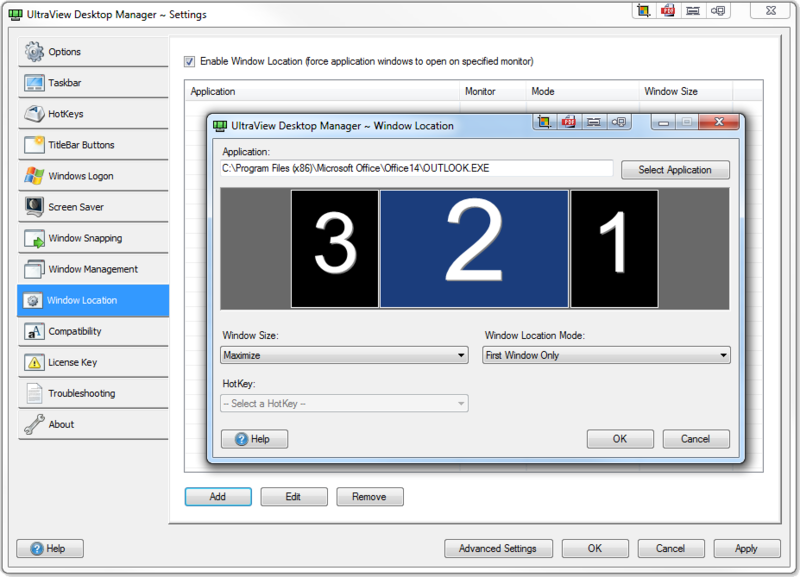 With UltraView Desktop Manager, you can easily set your preferred window locations as rules, applied automatically each time you launch the applications. In casual use, you may want to open an application on a particular monitor. You can do this reliably simply by using the Start Menu on that monitor to launch the application. 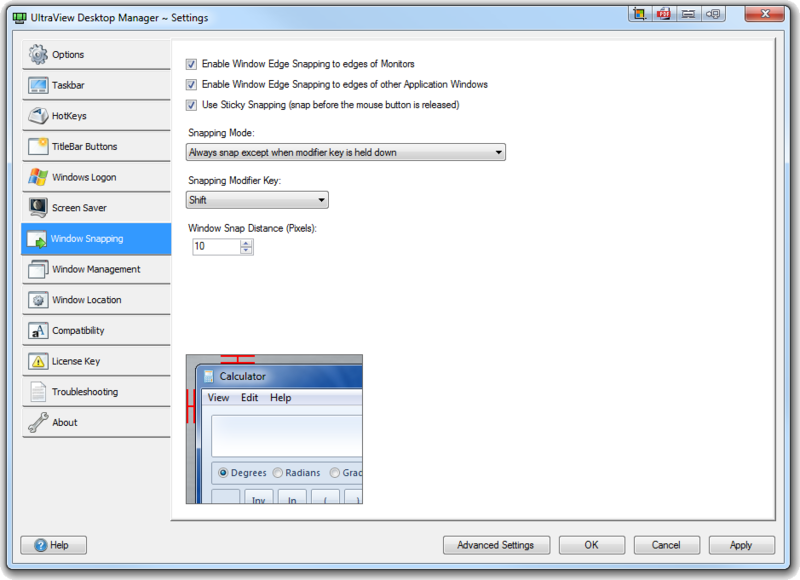 Automatic window location controls will position the application on the monitor from which you launched the application. Capture IQ is our new innovative screen-capture tool. 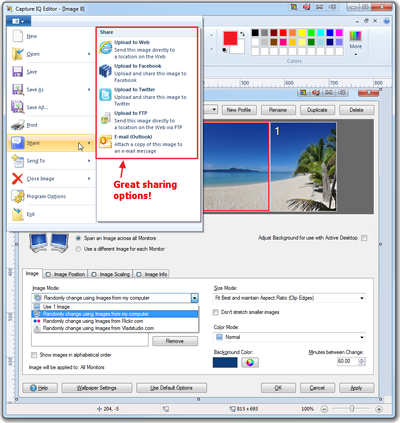 It provides flexible screen capture options combined with an image editor to crop, resize and annotate the capture "snapshots" with text, arrows, lines, boxes and other effects. 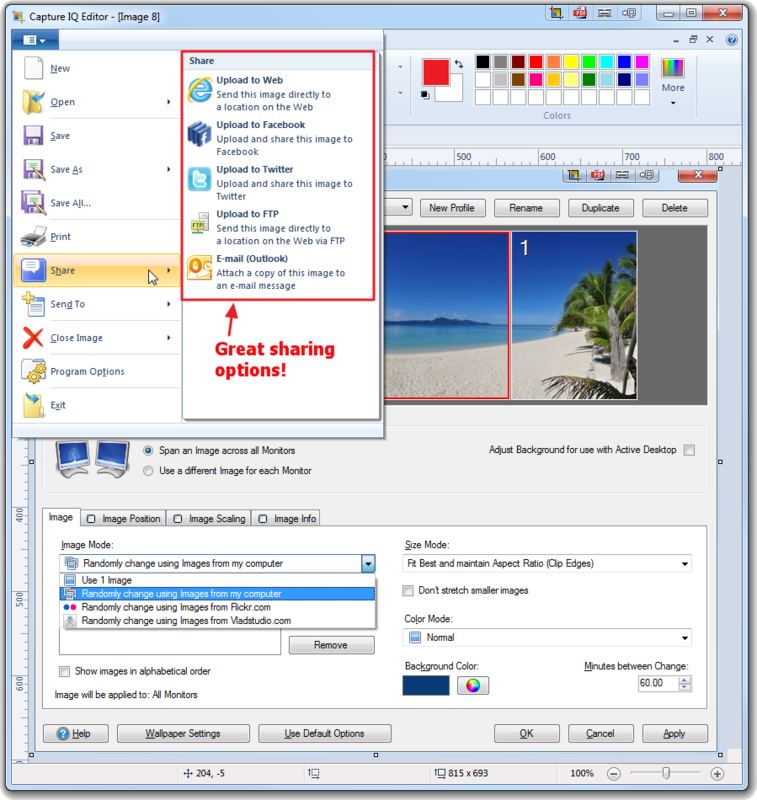 Similar to the popular SnagIt tool, Capture IQ delivers essential SnagIt-style features in a light-footprint utility. UltraView Desktop Manager integrates Capture IQ seamlessly with your applications through a title-bar button and menu that offers four popular capture options: Capture Active Window, Capture Window Control, Capture Scrolling Window, and Capture Region. This makes it easy to capture just what you need from any application or browser, without having to remember special hotkey combinations. Hotkeys are also supported. The Capture IQ Editor can manage multiple screen captures and offers an easy toolbar for popular actions such as resizing and annotating with text, boxes and arrows. Capture IQ offers a wealth of options for sharing your screen captures. The "Share" menu will send any capture to Outlook, Facebook, Twitter, FTP sites, or free Web hosts such as ImageShack offering on-demand guest hosting of images. 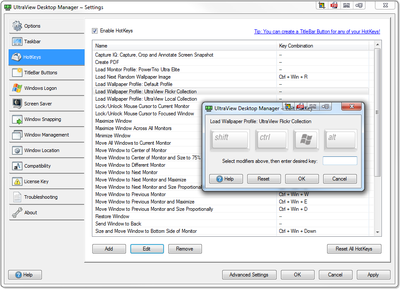 UltraView Desktop Manager offers more than 30 preconfigured HotKey options for frequent window and desktop management tasks. A control panel makes it easy to view, edit and add new HotKeys. Through the TitleBar Buttons control panel, you can edit defaults or add new buttons for frequent window-related tasks. Configuring your monitor layout in Windows can sometimes be confusing. 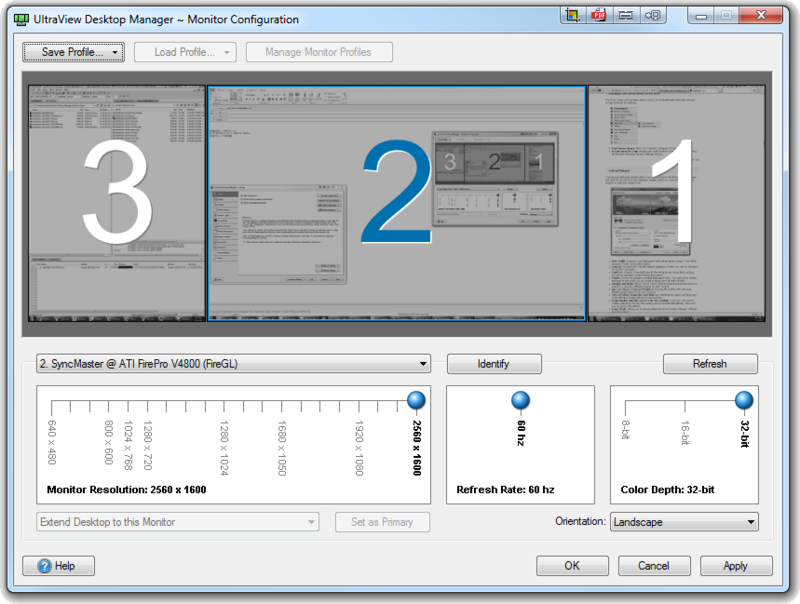 UltraView Desktop Manager makes monitor configuration simple, with a control panel that provides a live preview of each monitor's content. It's much easier to match the Windows layout with your actual desktop layout, simply by arranging the previews to match the physical layout. This avoids confusion with monitoring numbering (frequently not in ascending order). 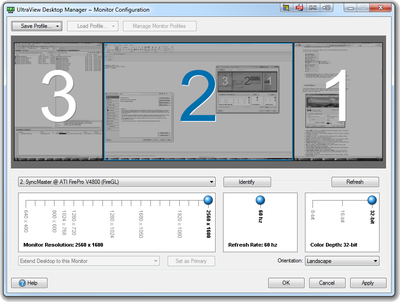 While Windows itself can't manage more than 10 attached monitors, the Monitor Configuration utility supports any number of attached monitors, making it vital for managing very large configurations. You can easily save configuration profiles and switch between profiles. For example, you may switch to single-monitor mode for gaming, and then back to a multi-monitor desktop for work, via menu or hotkey. 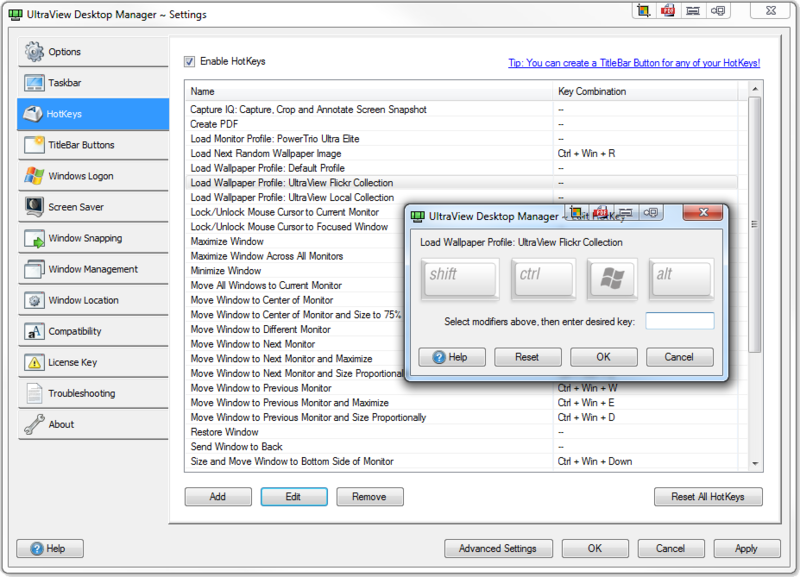 UltraView Desktop Manager can save many complex variables about your monitor configuration and wallpaper settings to profiles that you name and associate with a hotkey. For example, a financial trader may keep his configuration lean during trading, then turn on UltraView panoramic wallpaper loading from Flickr after trading hours with a simple hotkey. If he plays a game, he may switch to single-monitor configuration again with a single hotkey. As monitors get bigger and widescreen monitors become standard, it's now common to have two or more application windows or browser windows open side by side on the same monitor. Aligning these windows can be tedious. 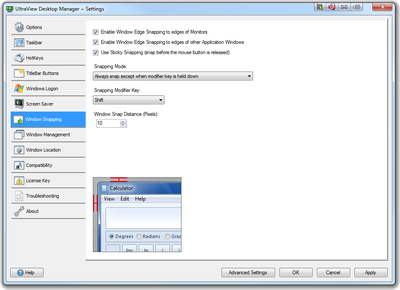 By default, UltraView Desktop Manager will automatically "snap" open windows to monitor edges or other windows when they are moved within 10 pixels distance. This makes it a "snap" to align open windows quickly. The snap distance and other snap behavior can be adjusted via a control panel. In addition to the desktop background, you can also customize the Windows logon screen with your preferred background image. 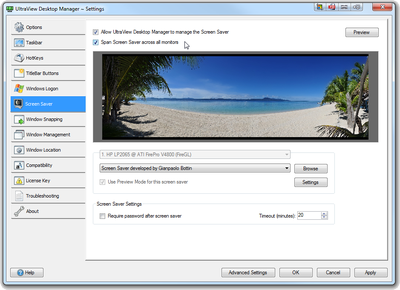 With automatic scaling enabled, images can be scaled and cropped automatically to fit the logon screen. 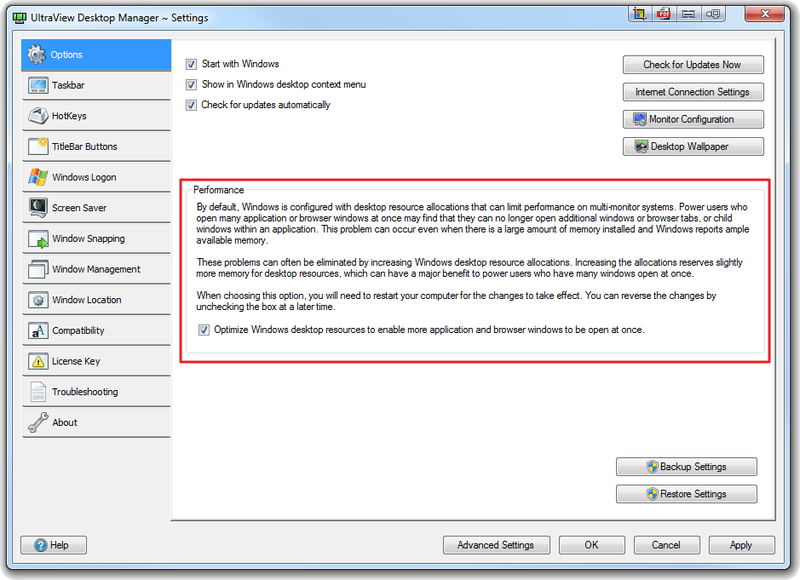 By default, Windows is configured with desktop resource allocations that can limit performance of some applications on multi-monitor systems. Power users who open many application windows (or browser windows/tabs) at once may find that they can no longer open additional windows or browser tabs, or child windows within an application. 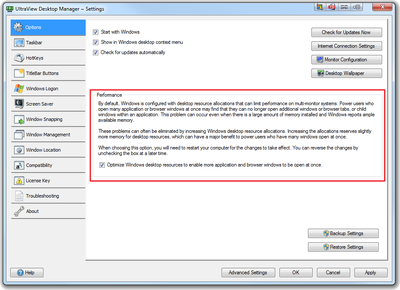 This problem can occur even when there is a large amount of memory installed and Windows reports ample available memory. These problems can often be eliminated by increasing Windows desktop resource allocations allowed per process or application. Increasing the allocations has almost no effect on memory consumption, but can have a major benefit for power users who have many windows open at once for primary applications or browsers. 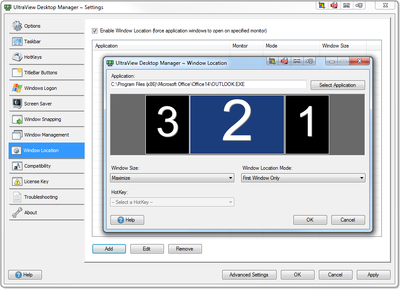 UltraView Desktop Manager applies several resource optimization adjustments automatically when installed. These adjustments enable up to double the number of application / browser windows and tabs for single-process applications (such as Firefox), and up to double the number of child windows within a single application, benefitting some financial trading platforms. The feature is controlled by a toggle. 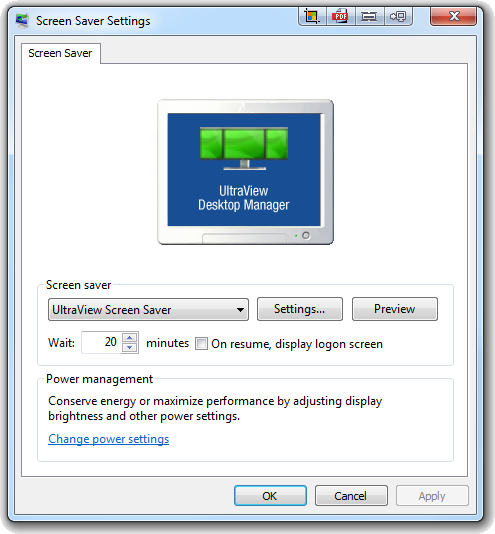 UltraView Desktop Manager provides advanced screen saver management, enabling a different screen saver on each monitor, or spanning a single screen saver across all your monitors. When combined with the UltraView Collection of 300+ panoramic images, spanning enables a dramatic panoramic screen saver that cycles among landscapes, seascapes and cityscapes around the world. Images can be loaded locally on your system drive, or downloaded on demand from Flickr.